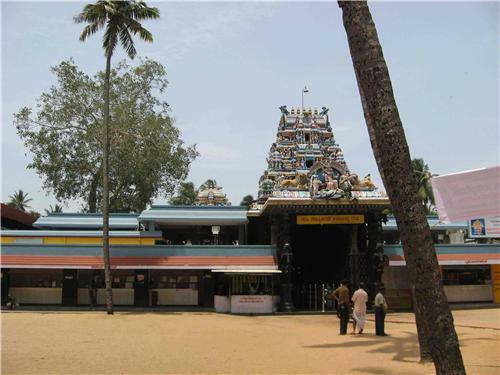 Attukal Bhagavathy Temple in Thiruvananthapuram is dedicated to Kanakki, who is worshipped as an incarnation of Parvathi. It is built in a combination of Kerala and Dravidian styles of architecture. The temple is the site of the annual Attukal Pongala festival held every February-March. Some 2.5 million women devotees gather here from early in the morning and prepare an offering made out of rice, jaggery, ghee, coconut and banana for the goddess. The event has been recorded in the Guinness Book of World Records as the largest gathering of women in the world. The temple has its origins in the legend of Kannaki, a pious woman who was accused of stealing the queen’s anklet. Kannaki’s husband Kovalan, had deserted her for a dancer but he came back to her after spending all his money. The penniless couple, who were left with only Kannaki’s anklets, went to Madurai to sell them. But the queen’s anklets were also reported stolen at the same time. They looked similar to Kannaki’s anklets and Kovalan was arrested for the theft, and beheaded. Enraged, Kannaki rushed to the palace and broke the other anklet to show that it contained rubies unlike the queen’s which contained pearls. She then cursed Madurai and attained salvation after the city’s patron goddess appeared to her. Kannaki is then said to have appeared in Attukal to an old man and instructed him to build a temple for her. The temple contains two idols of the goddess in the sanctum sanctorum along with other gods and goddesses around it. The idols of the goddess are resplendent with silks, gold and gems and the temples’ doors are profusely carved with images of deities. Its gopuram soars with images of several deities adorning it. 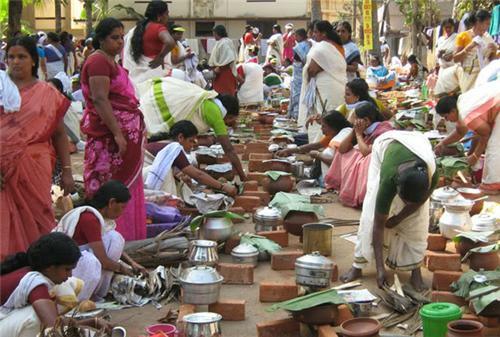 Kannaki’s devotees celebrate Attukal Pongala in her honour every year. During the ten-day festival, the devotees reenact the legend of Kannaki with dance and music. The festival finally culminates in lakhs of women gathering around the temple on the 9th day in the early hours to prepare to make pongala out of rice, jaggery, ghee, coconut and banana as an offering to the goddess. The streets in a radius of 5 km around the temple are cleared to enable the women to set up small fires and cook their offerings in pots. All offices and shops in the zone are shut for the day. They bring all they need themselves and the task begins with the roll of the temple drums. By noon the task is finished and the festival ends with the sprinkling of holy water all around and showering the flowers on the temple. It is indeed a stirring sight to see more than 2 million women engaged in making the offering for the goddess all at once. Kanakki’s devotees testify to the goddess’s power to grant their wishes, from a healthy life to blessing them with children. Location: Just off Attukal Road in Manacaud, 2km from the Sree Padmanabhaswamy Temple. How to get there: The temple is not far from the Central Bus Depot and Central Railway Station. Timings: 4.30 am – 8.30 pm.